Two dogs, Dubbin and Todd are going for a walk-before-breakfast but one of them, Dubbin, has wheels and can whirl along. The other, Todd, doesn’t have wheels; he is much smaller and struggles to keep up. To make matters worse, Todd has brought with him a very large bone which is attracting some unwelcome company.Can Dubbin, Todd and the bone get safely home? The illustrations are in water colour and gouache, with a grainy effect from rock salt crystals that captures the texture of pavements. DOG ON WHEELS. I absolutely love it, and so will my grandchildren. It's energetic - and jubilant! Woof! 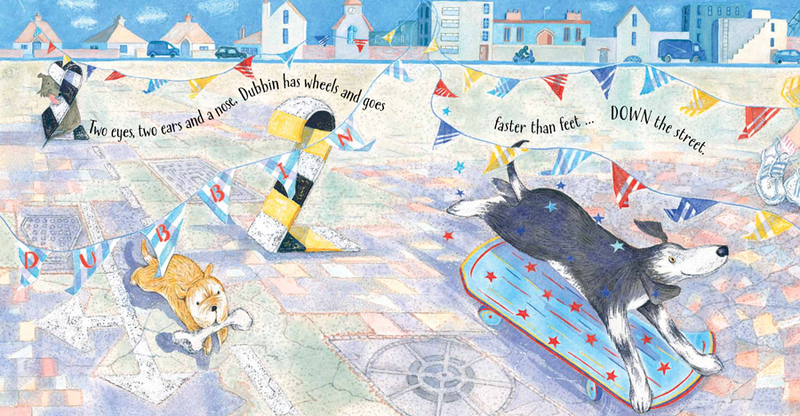 Children will love this story of a speedy skateboarding dog and his slower friend. Dubbin is eager to get out of the door even before breakfast, and can go wheeling down the street faster than feet on his skateboard. Todd gamely tries to keep up, taking his bone with him, which is a big mistake. He can’t keep up, and then another dog steals his bone. Fortunately, Dubbin is fearless as well as fast and saves the day. The rhyming text rolls along as speedily and smoothly as Dobbin’s skateboard wheels and both dogs are appealing characters. Well worth jumping on for a ride! This lovely rhyming story is about two dogs, Dubbin and Todd who go off on an exciting adventure, on nothing other than a skateboard! Mia thinks this book is hilarious, it is fast paced, exciting and full of fun! The illustrations are really interesting as they have been done in watercolour with rock crystals creating a lovely grainy effect that really captures the details in the pictures. With such a lively story and the use of rhyming verse, this is a great bedtime read for children of any age.